OJCS focuses on classic Jewish study. 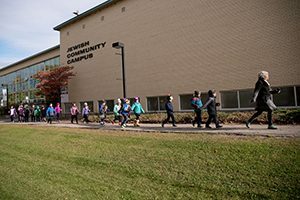 As a pluralistic community school, students learn about Judaism, Hebrew, Israel and Jewish values and traditions. 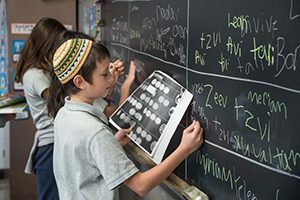 Through history, arts, language and interactive technology, students make their own connection to Judaism and begin their path of investigating what it means to be a Jew. Some of the subjects our students explore include Tzedakah and Tikkun Olam, the Torah and prophets, Jewish history, Jewish laws and customs. We offer students two streams of Hebrew language learning – Core and Ivrit. Grade six, seven, and eight Jewish studies are more thematically oriented, emphasizing the contemporary messages that one can derive from the study of text starting in Bereshit and expanding to other books of the Torah. In grade seven, the issues of relationships are discussed and how they relate to modern day situations and problems. 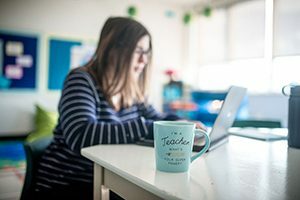 The grade eight curriculum has been dedicated to the topic of spirituality, as it pertains to the modern day Jew as derived from Torah text, starting from topics in Genesis and extending throughout the Torah text. Grade eight students also learn about ethical issues of a contemporary nature as derived from Talmudic sources. 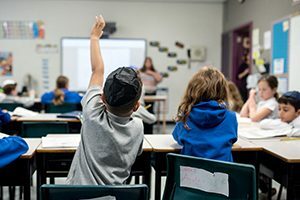 Jewish Court of All Time (JCAT): JCAT is a program sponsored by RAVSAK that brings Jewish History to life in classrooms through the creation of a trial that is based on a particular contemporary issue. 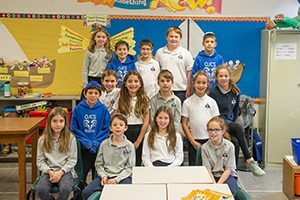 Partnership2Gether (P2G): In partnership with our sister school, Hanadiv, in Metullah, Israel, our students and teachers works on joint educational projects within our community. J-STEM: This program integrates secular and Jewish studies through the process of Science, Technology, Engineering and Math with Jewish Law.